If you had the chance to see the teaser trailer for How to Train Your Dragon 2 today (it has been temporarily pulled by the studio), it likely made you forget about any issues you have with 3D. Maybe you thought back to the first How to Train Your Dragon and what a memorable experience that was to see in the format. It was no surprise it tied with Avatar for the Venice Film Festival's award for Most Creative 3D Film Stereoscopic Film of the Year in 2010. DreamWorks Animation really knows what it's doing with 3D. And the sequel will be one of the few movies you'll really be wanting to pay the higher price for next summer. While we're thinking about films that got the 3D experience right, we thought it would be fun to discuss our top three most memorable experiences with the format. I'll share mine first, followed by some responses we've gotten from Twitter and then hopefully you'll comment with your own down below. 1. 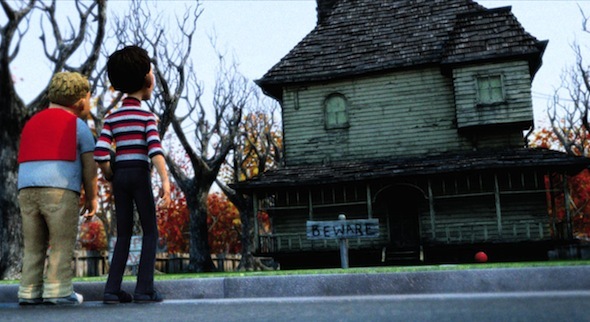 Monster House - I was right beside Jeffery Katzenberg from the beginning as one of the biggest early fans of digital 3D movies, and it all began with this 2006 animated feature (which was not produced by Katzenberg's DreamWorks Animation, but rather Robert Zemeckis's ImageMovers), which wowed me with its employment of the format for depth more than spectacle. I even still have my glasses from that first experience. 2. U2 3D - Another memory tied to a first for me. This was the first 3D film to make me see that we were entering a new era for concert films by giving us a whole new reason to feel like we're actually there experiencing the show live. It didn't matter that I'm not a huge U2 fan, just as later on it didn't matter that I'm not a fan of Justin Bieber for me to enjoy the 3D experience of Never Say Never. 3. Cave of Forgotten Dreams - Werner Herzog's documentary on the paintings and geological formations of the Chauvet Caves absolutely blew my mind with what 3D cinema could do. The film not only transports us to another place we are unable to go to more virtually than any before it, but the depth of space it provides also helps us to better consider the depths of time it deals with, too. @thefilmcynic Avatar, Life of Pi, Great Gatsby. Honorable Mention: How To Train Your Dragon (but that's animation). @thefilmcynic 1) How To Train Your Dragon, 2) Hugo, 3) G.I. Joe 2. The last one was because it gave me a seriously painful headache. @thefilmcynic Avatar (because it was my first), Hugo (because it made me realise 3D could work), Life Of Pi (because it worked beautifully). @thefilmcynic Life of Pi Final Destination 5 How to train your dragon. @thefilmcynic OCEAN WONDERLAND 3-D, GHOSTS OF THE ABYSS, and at home CREATURE FROM THE BLACK LAGOON on 3-D Blu. @thefilmcynic Monsters vs. Aliens, How to Train Your Dragon, Hugo. @thefilmcynic UP, NASCAR: The IMAX Experience, and THE VIEWER, a 2009 short at @FantasiaFest that used old school red-blue 3-D glasses. @thefilmcynic JACKASS 3D, TRON: LEGACY and DISNEY'S A CHRISTMAS CAROL. @thefilmcynic 1. Avatar 2. John Carter 3. Tron: Legacy. I would put the Honey, I Shrunk the Audience from Epcot as well. @thefilmcynic All three times I saw Cave of Forgotten Dreams.